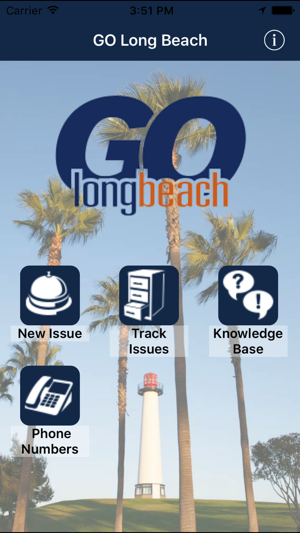 GO Long Beach is an App is designed to provide Long Beach, CA residents, businesses, and visitors the opportunity to access City Hall, 24-hours a day, 7 days a week, from anywhere. You will be able to quickly submit service requests for issues such as graffiti, potholes and sign damage. iPhone users can simply open the App, select an issue, take a picture, and tap submit – the App knows the exact location and sends the issue directly to city staff. You will also be able to track the status of your requests through your iPhone. I’ve used this app several times when I’ve noticed graffiti. It gets taken care of right away and they left you know when it gets resolved. It's fine but it needs more features like reporting dog barking and other animal-related issues. The only animal issue is dead animal pickup so it would be nice to see some other issues added. It’s not the prettiest app, but I have used the GoLB app to report a fair amount of furniture dumped in the alley and the powers that be are relatively responsive in collecting such items. It has proved to be a useful tool in helping to keep my block from falling into disrepair.